The Battle of the Hydaspes was a major battle fought by Alexander III the GreatThe Battle of the Hydaspes was fought by Alexander the Great in 326 BC against King Porus of the Paurava kingdom on the banks of the river Hydaspes (now known as the Jhelum) in the Punjab near Bhera. The battle resulted in a complete Macedonian victory and the annexation of the Punjab, which lay beyond the far easternmost confines of the already absorbed Persian empire, into the Alexandrian Empire. Alexander's decision to cross the monsoon-swollen river despite close Indian surveillance, in order to catch Porus' army in the flank, has been referred as one of his "masterpieces". Although victorious, it was also the most costly battle fought by the Macedonians. The resistance put up by King Porus and his men won the respect of Alexander, who asked Porus to become a Macedonian satrap. The battle is historically significant for opening up India to Greek political (Seleucid, Greco-Bactrian, Indo-Greek) and cultural influences (Greco-Buddhist art), which continued to have an impact for many centuries. The battle took place on the east bank of the Hydaspes River (now called the Jhelum, a tributary of the Indus) in what is now present-day Punjab. Alexander later founded the city of Nicaea on the site; this city has yet to be discovered. Any attempt to find the ancient battle site is complicated by considerable changes to the landscape over time. For the moment, the most plausible location is just south of the city of Jhelum, where the ancient main road crossed the river and where a Buddhist source mentions a city that may be Nicaea. The identification of the battle site near modern Jalalpur/Haranpur is certainly erroneous, as the river (in ancient times) meandered far from these cities. Background After Alexander defeated the last of the Achaemenid Empire's forces under Bessus and Spitamenes in 328 BC, he began a new campaign to further extend his empire towards India in 327 BC. Whilst possessing a much larger army, at the battle, an estimated 40,000 infantry and 5,000 cavalry crossed the river in time to engage the enemy. Depending on the source, Alexander was outnumbered somewhere between 3:1 and 5:1. The primary Greek column entered via the Khyber Pass, but a smaller force under the personal command of Alexander went through the northern route, taking the fortress of Aornos (modern-day Pir-Sar) along the way—a place of mythological significance to the Greeks as, according to legend, Herakles had failed to occupy it when he campaigned to India. In early spring of the next year, he combined his forces and allied with Taxiles (also Ambhi), the King of Taxila, against Taxiles' neighbor, the King of Hydaspes. Motives Alexander had to subdue King Porus in order to keep marching east. To leave such a strong opponent at his flanks would endanger any further exploit. He could also not afford to show any weakness if he wanted to keep the loyalty of the already subdued Indian princes. Porus had to defend his kingdom and chose the perfect spot to check Alexander's advance. Although he lost the battle, he became the most successful recorded opponent of Alexander. Pre-battle maneuvers Alexander's crossing of the Hydaspes River. Porus awaits the attack of Alexander July 326 B.C. Porus drew up on the south bank of the Jhelum River to repel any crossing. The Jhelum River was deep and fast enough that any opposition to a crossing would probably doom the attacking force. Alexander knew that a direct approach had little chance of success and tried to find alternative fords. He moved his mounted troops up and down the river bank each night while Porus shadowed him. Eventually, Alexander used a suitable crossing, about 27 km (17 mi) upstream of his camp. His plan was a classic pincer maneuver. He left his general Craterus behind with most of the army, while he crossed the river upstream with a strong contingent, consisting, according to Arrian of 6,000 on foot and 5,000 on horseback, though it is probable that it was larger. Craterus was ordered to either ford the river and attack if Porus faced Alexander with all his troops or to hold his position if Porus faced Alexander with only part of his army. Alexander quietly moved his part of the army upstream and then traversed the river in utmost secrecy, using ‘skin floats filled with hay’ as well as ‘smaller vessels cut in half, the thirty oared galleys into three’. Furthermore, Craterus engaged in frequent feints that he may cross the river. As a result, Porus, 'no longer expecting a sudden attempt under cover of darkness, was lulled into a sense of security.' Alexander mistakenly landed on an island, but soon crossed to the other side. Porus perceived his opponent's maneuver and sent a small cavalry and chariot force under his son, also named Porus, to fight them off, hoping that he would be able to prevent his crossing. Alexander had already crossed the river, however, and his horse archers impeded the young Porus's cavalry. Young Porus also faced an unexpected disadvantage: his chariots were immobilized by the mud near the shore of the river. After his army was routed, young Porus was among the dead. As news reached the elder Porus, he understood that Alexander had crossed to his side of the river and hastened to face him with the best part of his army, leaving behind a small detachment to disrupt the landing of Craterus' force should he attempt to cross the river. Battle Combined attack of cavalry and infantry. An imaginary Indian war elephant against Alexander's army, by Johannes van den Avele. When Porus reached the point where Alexander's army was arrayed, he deployed his forces and commenced the attack. The Indians were poised with cavalry on both flanks, their center comprising infantry with elephants towering among or before them in equal intervals. The elephants caused much harm to the Macedonian phalanx, but were eventually repulsed by the dense pikes of the phallangitai, wreaking much havoc upon their own lines. Alexander started the battle by sending horse archers to shower the Indian left cavalry wing. Then, he led the charge against the weakened Indian wing. The rest of the Indian cavalry galloped to their hard pressed kinsmen but at this moment, Coenus's cavalry contingent appeared on the Indian rear. The Indians tried to form a double phalanx, but the necessary complicated maneuvers brought even more confusion into their ranks making it easier for the Macedonian horse to conquer. The remaining Indian cavalry fled among the elephants for protection, but the beasts were already out of control and would soon retreat exhausted from the field, leaving the rest of Porus's army encircled by the Macedonian horse and phalanx. At this time, the phallangitai locked their shields and advanced upon the confused enemy. Porus, after putting up a brave fight, surrendered and the battle was finally over. According to Justin, during the battle, Porus challenged Alexander, who charged him on horseback. Alexander fell off his horse in the ensuing duel, his bodyguards carrying him off and capturing Porus. According to Arrian, Macedonian losses amounted to 310. However the military historian J.F.C. Fuller sees as "more realistic" the figure given by Diodorus of about 1,000, a large number for a victor, yet not improbable, considering the partial success of the Indian war elephants. Indian losses amounted to 23,000 according to Arrian, 12,000 dead and over 9,000 men captured according to Diodorus. The last two numbers are remarkably close, if it is assumed that Arrian added any prisoners to the total Indian casualties. Around 80 elephants were captured alive. Two sons of Porus were killed during the battle, as well as his relative and ally Spitakes, and most of his chieftains. Aftermath A painting by Charles Le Brun depicting Alexander and Porus during the Battle of the Hydaspes. The bravery, war skills and princely attitude of Porus greatly impressed Alexander, who allowed him to rule Hydaspes in Alexander's name. Wounded in his shoulder, standing at over 2.1 m (7 feet) tall, he was asked by Alexander how he wished to be treated. "Treat me as a king would treat another king" Porus responded. Alexander would indeed treat him like a king, allowing him to retain his kingship. The Macedonian king of most of the known world founded two cities in this region, one at the spot of the battle called Nicaea (Greek for Victory) in commemoration of his success and one on the other side of the Hydaspes called Alexandria Bucephalus, to honor his faithful steed, which died soon after this battle. In 326 BC, the army of Alexander the Great approached the boundaries of the Nanda Empire. His army, exhausted from the continuous campaigning and frightened at the prospect of facing yet another gigantic Indian army, demanded that they should return to the west. This happened at the Hyphasis (modern Beas), the exact spot being believed to be at 'Kathgarh' in Indora tehsil of Himachal Pradesh with nearest rail head at Pathankot, Punjab. Alexander finally gave in and turned south, along the Indus, securing the banks of the river as the borders of his empire. Thematic Summary 1. 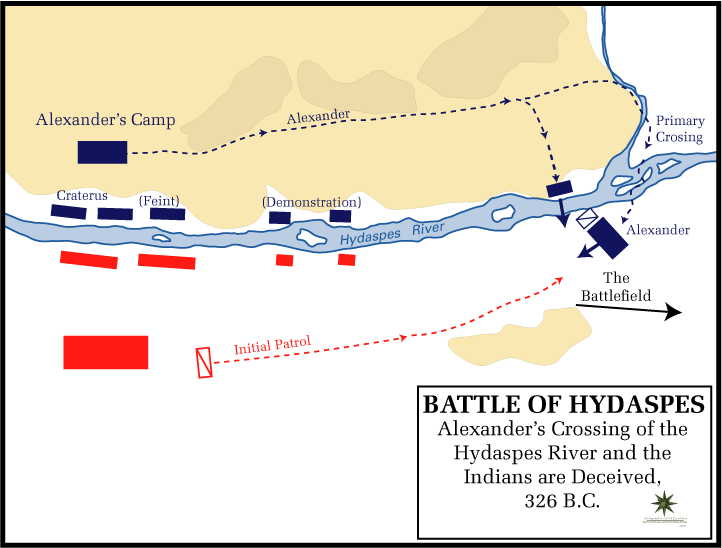 The most notable event in the present connection was Alexander's crossing of the Hydaspes in face of the Indians on the opposite bank. The complex preparations for the crossing were accomplished with the use of numerous feints and other sorts of deceptions. Porus was kept continuously on the move until he decided it was a bluff and relaxed. On every visit to the site of the crossing, Alexander made a detour inland to stay in secrecy. It was also reported that there was an Alexander look-alike who held sway in a mock royal tent near the base. 2. By chance a storm occurred on the night of the crossing. It drowned the sounds of the crossing. 3. The chariots sent by the Indian army on the far bank got stuck in the mud and were useless. 4. The 200 elephants prevented any frontal attack. Alexander thus launched a mass attack against Porus's left flank. Alexander surmised correctly that Porus would be forced to move cavalry on the right wing across to the left. Alexander foresaw this and placed his cavalry, under the command of Coenus, opposite of them and out of sight. Their job was to break cover and follow the Indian cavalry, which forced the Indians to divide their force and face both ways. 5. Alexander sent his phalanx to attack the elephants, which were forced back on their own side. They boxed the Indian infantry and cavalry, many of whom were trampled to death. 6. Craterus and his force in the base camp crossed the river when the way was clear, and they conducted a chase against those who escaped.